For years now, the Economist has published its famous “Big Mac Index”, a system using McDonald’s famous hamburger to determine the disparity between purchasing power in different countries. It’s a good system, even if it’s kind of funny, because it measures a product that is mostly the same in every country. There’s Big Macs almost everywhere, and it’s a way to judge how different the real cost of the same product is in different countries. But now, as a counter-point, I’d like to suggest a different kind of index: the “McFlurry Disparity Index”. It makes use of another popular McDonald’s product, their McFlurry, to determine the different ways a multinational corporation ends up treating people in different parts of the world. And what you see there is a horrible case of injustice! The McFlurry is, typically, a soft-serve ice cream dessert that has different sauces and toppings blended in, using a special mixer. It was first introduced by McDonalds in 1995, in Canada. It was undoubtedly a response to the popularity in that country of the Dairy Queen Blizzard, a very similar ice-cream dessert, which is the most famous one that rival fast-food chain offers. Its most classic topping is probably Oreo cookies. But it’s also used M&Ms, Reece’s, bits of Mars Bars, and a wide number of other toppings, including many regional variations. It’s sold in most international McDonald’s markets. But unlike the Big Mac, which tends to be similar wherever you go, there’s a huge range in McFlurries, not only in terms of toppings, but in terms of quality. 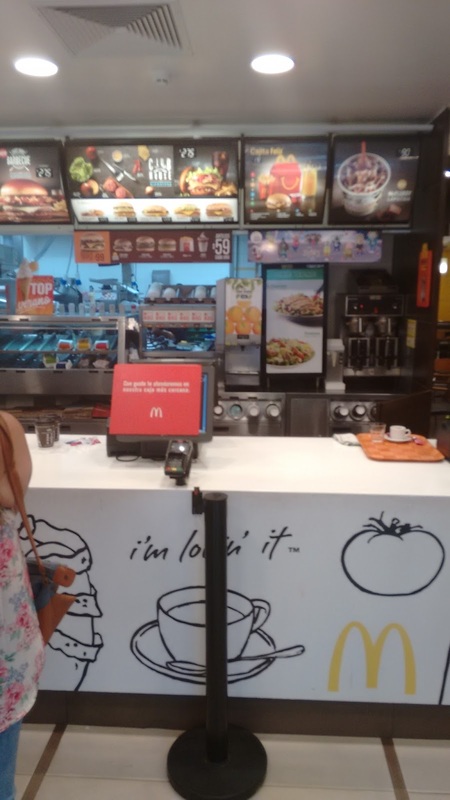 As you’re about to see, in some countries McDonald’s customers get the royal treatment when they order this treat, and in others, they get the shaft. 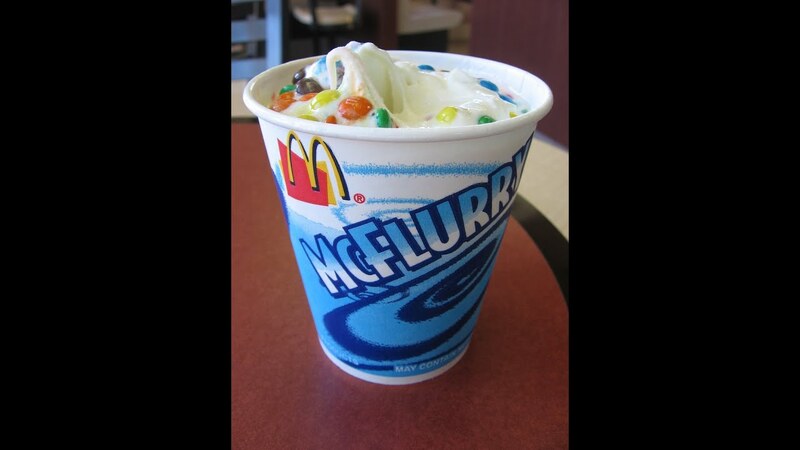 The picture above is your standard McFlurry, the kind you’ll find for the most part in the USA or Canada, and a lot of other regular markets for McDonald’s. It looks a bit small, but at least it’s exotic! 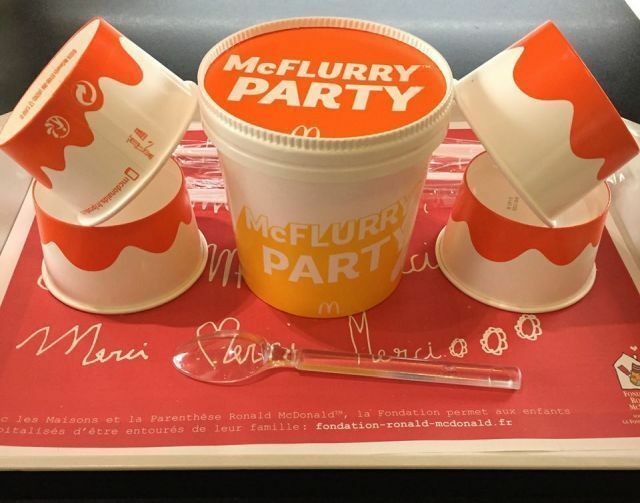 Meanwhile, in France, the locals get possibly the most impressive McFlurry offering of them all, the giant-sized “McFlurry Party“. Clearly, the picky French get to be the most privileged McFlurry customers in the world! It’s so large that it comes with extra cups, just in case you want to share it. It comes with a choice of five different candies, including Oreos, Kit Kat Balls, or M&Ms; and with either chocolate or caramel sauce. But if you’re living in the USA and feeling a bit jealous of the French, wondering what they did apart from getting their asses kicked in a couple of world wars to deserve such fancy treatment from the McDonald’s corporation, consider what people living South America must feel. THEY DON’T EVEN MIX IT! You get a half-cup of soft-serve, with the sauce and topping just dumped on the top. Then you have to mix it yourself, by hand, like some kind of peasant. It’s not some kind of exceptional case of badly-made product. 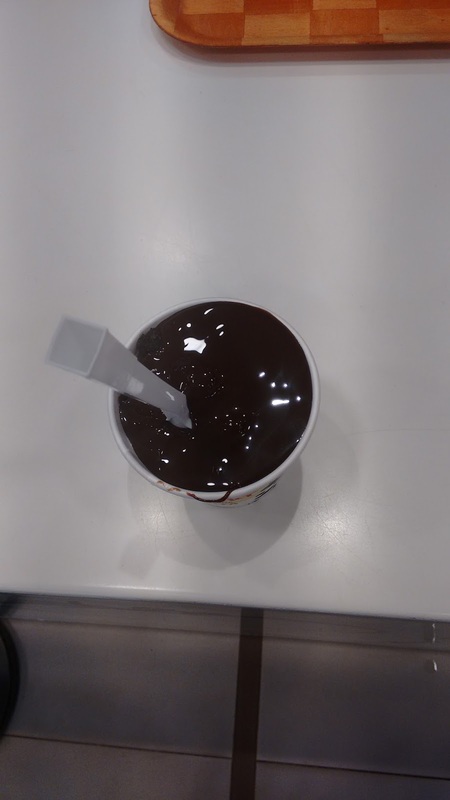 EVERY single McFlurry they make for you in Uruguay pretty much looks like that. Sometimes the server will stir it a couple of times themselves, but that’s as fancy as it gets. 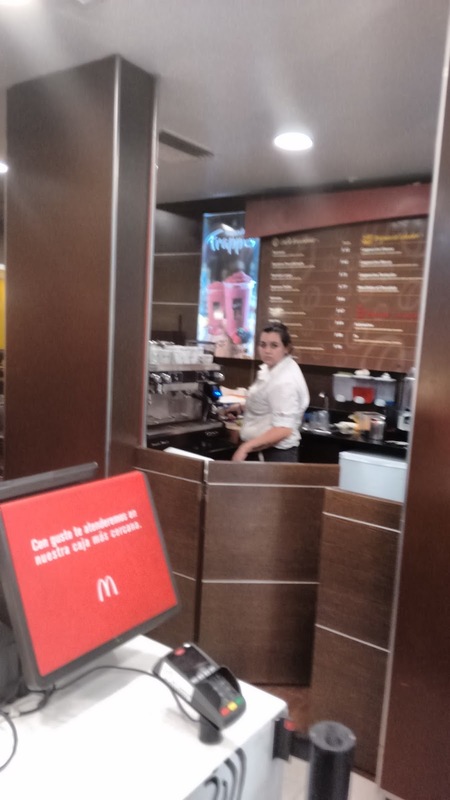 I actually took the journalistic initiative to talk to the manager (the nervous-looking woman in the McCafe photo, who was wondering what the hell I was doing taking pictures of a McDonald’s), and she told me that this is standard policy for McDonald’s in Uruguay and many other countries in South America. They don’t mix it with their special mixing machines because, according to them, they don’t even have mixing machines. I guess McDonald’s thought that, in spite of South America being a fairly big market for them, and ice cream being a very popular dessert product, actually making a freaking McFlurry the right way just didn’t matter in the ‘third world’. So there you have it: McDonald’s has a serious quality-gap when it comes to its ice cream treats. If you live in France, you’re treated like a pre-revolutionary King. If you’re in the U.S., you get the standard package. If you’re in Asia, you get all kinds of weird and wonderful flavors. And if you’re in Latin America, you don’t even get it mixed. You want a real social justice cause to worry about? Here you go! Where are the street protests over the sub-par treatment of desserts by manipulative multinational corporations in the 3rd world?! Why do you have to speak French to get the super-giant sized version?? On second thought, screw the McFlurries.